In this entry, Eleanor Bowen, who has worked on the project for over a year, reflects on what she has found out about the theatre mentioned in her grandmother’s 1917 diary. My grandmother Gladys (Peggy) Simmons kept a diary 101 years ago, in 1917. She was 23 and passionate about theatre. The diary, a Liberty’s Shakespeare Calendar, allowed the writer a single line for each day, and it was this enforced brevity that gave me the idea of tweeting it. You can find the tweets at @peggymeg7. Here are just a couple of entries, with some findings from the research I have done, inspired by these entries. Wed May 9. Empire with Ruby – Zig-Zag – good! In Peggy’s entry on Wednesday 9 May 1917 she refers to Zig-Zag, which she saw with her friend Ruby at the Empire Theatre, Cardiff. Her only comment was ‘Good!’ Zig-Zag, referred to at the time as a ‘super-review’, was one of the two new productions she saw in 1917. I found an advert for the 7 May performance in the British Newspaper Archive, and this included a photograph of Miss Nellie Turner. Turner, a comedienne with a Vaudeville background took on the role which had been made famous by Daphne Pollard. 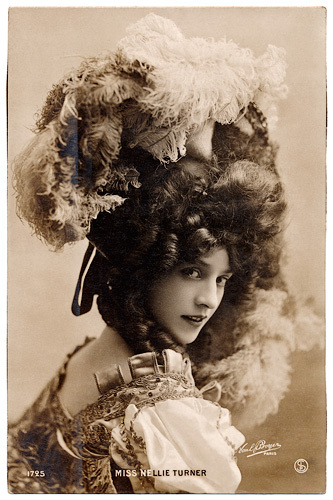 I’ve found very little on Nellie Turner, the performer in the Cardiff production, other than that she was a ‘stage and pantomime actress’ – although there are some wonderful postcards of her in 1907, ten years earlier, on Pinterest. For more about Zig-Zag!, see the twitter entries here. On 28 May, as a keen amateur painter Peggy ‘painted in morning’, and later went to tea with her aunt and family who lived a few streets away in Cardiff. Peggy then simply adds the words “General Post”, and I assume here that she was noting a production of the new play General Post as recommended by Auntie Rose, who could well have seen it in London. I found Jack’s comparison of ‘Betty’ to his beloved Peggy (‘both in appearance & style’) most moving because this extraordinarily vivid footage of the film at the BFI gives me a glimpse of the grandmother I never met, as seen by Jack at the time. N.b. Jack notes the total cost of theatre tickets at 4/8d.